Cars are supposed to carry people, but in Nepal people carried cars on the rocky, hilly trail from Kathmandu. Automobiles, stripped of wheels and bumpers, were shoulder-borne to and from the capital, the only Nepalese city with modern roads. This old German-made Mercedes was being transported to India as a trade-in on a shiny American model. Some 60 coolies, moving to the rhythm of a chant, balanced it on long poles. This was before the serpentine Tribhuvan Highway linking the capital to the Indian border was constructed in 1956, and the only way to get to Kathmandu was on foot or to fly. Cars bought mainly by the Rana or Shah nobility were brought to Calcutta by ship, driven sometimes up to Bhimphedi and then carried over the mountains by porters. 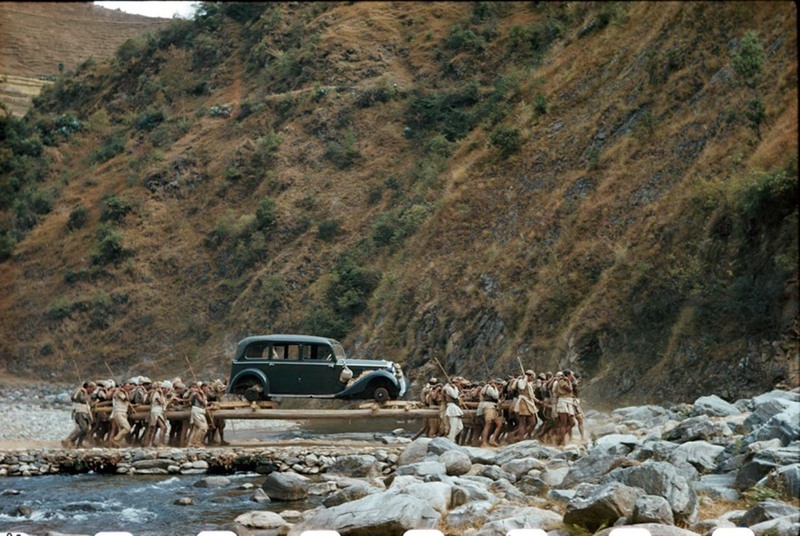 The cars were secured onto long bamboo poles and bigger cars required up to 96 porters to heave up the trails. The porters didn’t even knew the model of the cars they were carrying, they just called them 32, 64, 96 depending on the number of people carrying them. Here’s a brief video showing the car being carried. This photograph was taken in 1948 by the German American photographer Volkmar Wentzel and published for the first time in 1950 on the National Geographic magazine.